Today we are going to touch on two of the many different patterns that can be found in an Astrology Chart. We will continue looking at the various patterns in our Astrology posts to follow. The splash pattern in an Astrology chart would have all the planets spread throughout the whole chart. There should not be any more than two planets found in any given house and there would be no more than three houses found without a planets located within them. The houses with no planets found in them should be spread throughout the chart and none of these houses would be adjacent to one another. 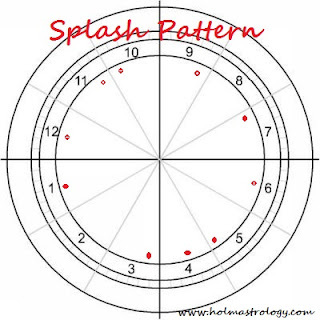 With the Splash pattern, the energies would be similar to the energies of Gemini. Gemini individuals tend to have many interests and will often scatter themselves in many different directions at the same time. They like variety and rarely become overly familiar with one particular topic. This layout of the planets and luminaries is similar to this as the individual tends to scatter their energies rather than focus their attention on any one particular area of life. Remember the houses in Astrology indicate different areas of life. 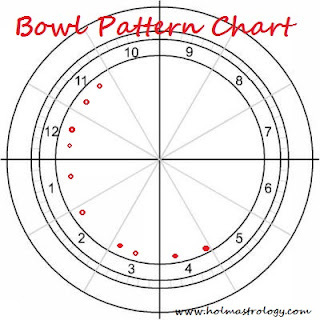 The bowl pattern is very much looks like a bowl as all of the planets are found within 180 degrees of one another and the other half of the chart is empty of planets or luminaries. 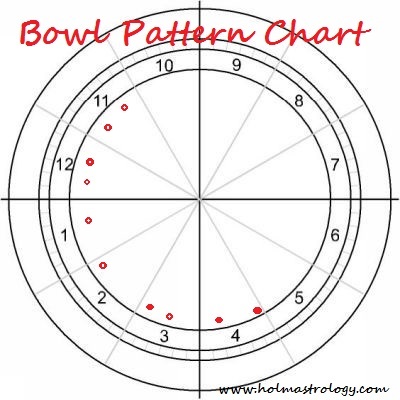 The bowl pattern can be found anywhere in the chart regardless of hemisphere positioning. Some Astrologers allow up to and include 190 degrees of used space, with the remainder 170 degrees being left empty. 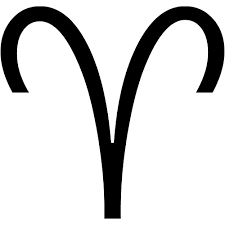 As all the planets are found in a relatively confined area of the chart, these individual operate in a self-sufficient fashion. Many rely on themselves in comprehensive and conclusive manners, the energies of which are identified by the houses that the planets are found in. The first planet from the ascendant identifies the energies used by the individual to accomplish goals and reach their objectives. If you take the midpoint of this configuration (the half-way point between the two outside planets) and look at the opposite point of this midpoint, the area by house and sign position is often the area of life where the energies of the individual will be focused. They can work within the area where the planets are found but will primarily focus their energies at the opposite end of the midpoint of the bowl. This is often an area that needs to be integrated into their lives. Are You Going to Collingwood Fair?